The LNFS-100 is a low noise synthesizer with an output frequency range of 1ìHz to 120 MHz. The synthesizer has 48 bit frequency resolution, 14 bit phase resolution and 12 bit amplitude control. The low noise internal time base can be phase-locked to an external 10 MHz signal for long term stability and accuracy. The synthesizer can be used as a frequency source for instrumentation, microwave synthesis, phase noise characterization, radar synthesizers and telecommunication clock systems. The LNFS-100 has AM, FM, PM, FSK, ASK, and BPSK modulation capabilities. Model LNFS-100-RM comes in a 2U rack-mount enclosure with LCD display and keypad. 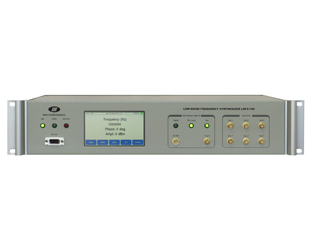 Remote control of the instrument is available through a RS-232 interface. This unit may be ordered with up to three independent synthesizers locked to the internal time base.